Signing up for a Quora account is a great way to promote your business and start building authority in your industry. 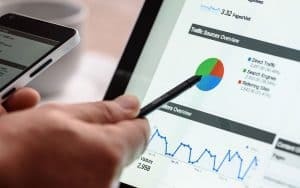 Not only will it connect you with people who have questions in your industry but it can also grow visitor traffic to your website. Among those benefits you’ll also build authority as an expert in your industry. I don’t know about you but I trust people if what they know is more visible. Telling me you’re an expert and can fix a problem isn’t enough in this hyper-competitive world. Someone who needs your business to solve their problem probably has a few questions of their own because they’re knowledgeable enough to at least know they have a problem. The problem is always solving that problem. Quora is the perfect opportunity for you to show people that you can solve their problem. That will help your business in a number of ways. One of the most powerful tools to connect with an audience as a business owner is to talk directly to them. That means helping people solve their problems. You as a business owner are selling a solution to something (yes, even products are solutions to something). The problem your business solves could be bad breath or lack of motivation. Whatever it is you are the expert and need to prove that. Quora offers a great opportunity to do what businesses do best, solve problems. Solving problems is never about selling though, it’s about helping. That’s what Quora is good for. Quora is the best place on the internet to help people. There are 10’s of thousands of questions asked each day on Quora. There’s a good chance there’s a lot of questions asked that you would be an expert at answering. Your answers help build your authority and help people out. If you have more resources for people on your website then you can provide a link. 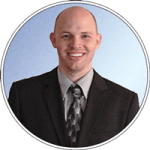 That’s a great way to build traffic to your website and become a known expert in your business. Not only that but by answering questions and increasing your exposure to people you’ll also increase your chances of getting links to your website if you’ve written in-depth helpful blog posts. That’s great for search engine optimization. 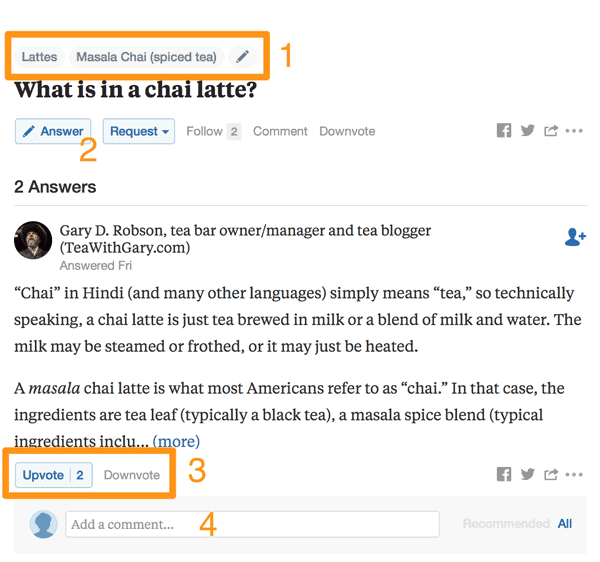 Quora is a powerful tool for building authority and increasing your exposure to potential consumers of your product or service. You’ll be able to promote your content (in a discrete manner) to get it to catch on more. 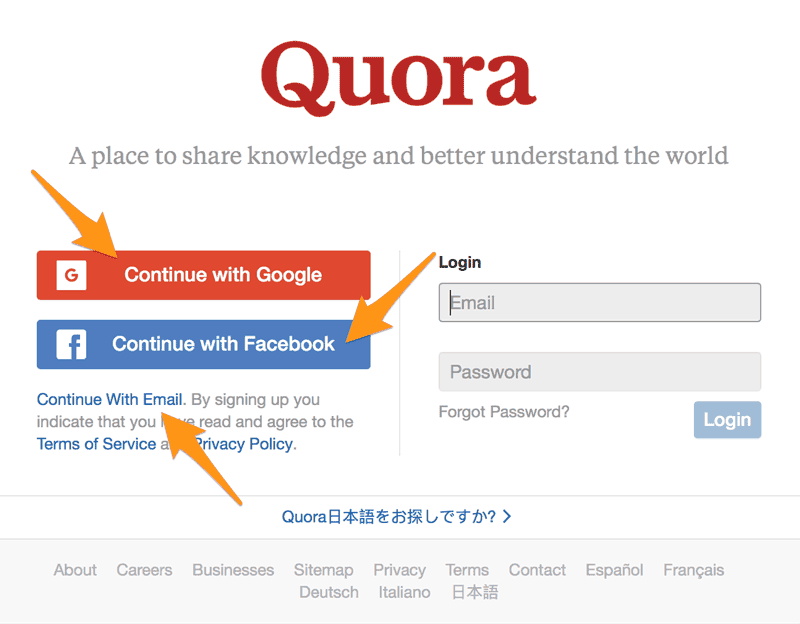 Before you start answering questions you need to get signed up for Quora so you can start participating. Signing up for Quora is the first big step to answering questions on Quora. The thing to remember when signing up is that you’re a representative for your business. Even if you’re the only person in your business and it’s all yours, you’re still a representative. That means your Quora account will be set up under your name rather than your business. Don’t try to answer questions anonymously as your business, nobody trusts the intent there. It looks shady and salesy and that never flies on Quora. When you try to create your account as a business then its much less trusting and wreaks of self promotion from the start. You want to give yourself the opportunity to gain authority rather than looking like a self promoter from the start. The first thing you need to do is head over to Quora and create your account. There are three different ways you can use to create your Quora account. Use your Google account to sign in to Quora and create your profile. 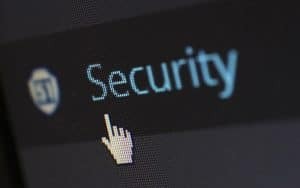 Create a Quora account by using your email address and creating a password. Once you start the account creation process you’ll initially go through a setup wizard that simplifies getting started. The setup wizard only covers so much though because much of the setup will happen as you start answering questions. You’ll see what I mean later. Now that you created your account the first thing to do is choose 10 topics of interest. These of course will be things related to your business primarily but you’re welcome to add a few personal interests in there too. In fact, some personal interests may be necessary because 10 is quite a few. Next is where Quora gets information to tailor the questions it sends your way. 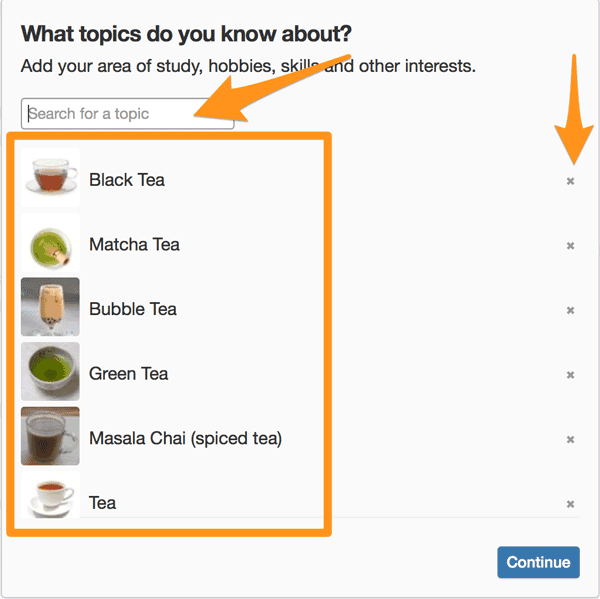 Use the search box to search for topics that you’re able to answer. 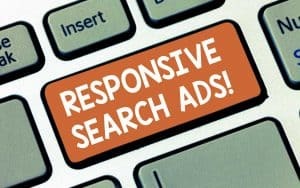 Anything relating to your business is perfect to search for. As you type, a list of topics will appear for you to select from. This could give you some great ideas. If you accidentally add a topic and wish to remove it, use the x next to each item. The more topics you add related to your business the better off you’ll be. You want to answer many questions and do a great job at answering them. This will maximize your exposure to good questions. Quora will ask if you’d like to find your Facebook friends to see their answers. Don’t do this unless you have a lot of business connections on Facebook and aren’t going to clutter your Quora account with random questions friends and family are asking. You definitely want to represent yourself and be seen. That means your profile needs a picture of you so people can see who’s answering questions. A lot of people will potentially see your answers and not just those asking the question. Having a complete profile with a photo will build trust. To add a profile picture you have to go into your profile settings. You can get there by clicking the avatar photo and then profile. On an iPhone it’s in the “You” tab. You have to tap the 3 dots at the bottom of the profile and then select edit profile. 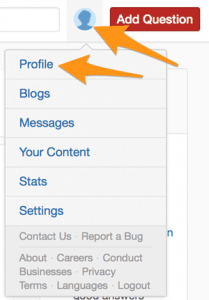 Add a picture of you, make as many other updates in your profile as you can and then save your profile. The more complete your profile the more trustworthy you’ll appear. Now it’s a good time to start looking into answers questions. 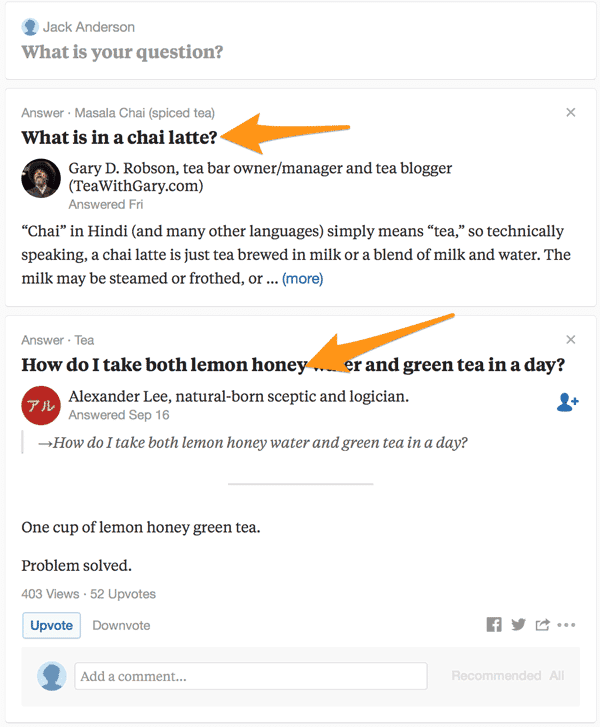 Now Quora will create your personalized feed with a list of questions you can answer. Many of the questions may already have answers but that doesn’t mean you can’t add your own answer. The key to answering a question that has already been answered is to add more value than the best answer. You can ask your own questions (the “what is your question?” box at the top) or you can browse your feed of questions. If you want to answer any question just click on the heading to see previous answers and see the answer button. When you get to the question’s answer page then you’ll see a lot of different options if the question has been answered before. If you get a new question with no answers then you can either answer it (the blue answer button) or you can request someone else answer the question (perhaps a coworker). Tags – you can click on these tags to get a whole list of questions which also have this tag. This is an easy way to discover new questions to answer. Answer (or request) – this is where you can open the box to answer the question. You can add basic formatting to your answer, pictures, and even links. Make your answers as rich as you possibly can by getting into detail and providing imagery if possible. Upvote/downvote – you can upvote and downvote current answers to the question. 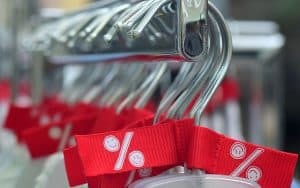 This is a great way to get recognized and create a reputation with other experts. Make sure you’re respectful and create positive reputations instead of trying to sabotage. Comment – you can comment on other’s answers and create a good dialogue. This is also a great way to create a positive reputation and connect with other experts. Use this to your benefit to add value to an already good answer and spark a conversation about deeper thoughts. Once you find a good question to answer and use the answer button you’ll have to formulate the perfect answer to the question. Edit your credentials if you don’t have any for this answer. You can have many different credentials in Quora and you can select which credentials to use for any given question. Always choose the credential that best makes you the authority to answer the question. Depending on which credential type you choose you’ll get different options of information to enter. For example, if you select location then Quora will ask you what location and the dates you lived there. Make sure before you post any answer you’ve either selected a relevant credential or you create a new one for that answer. A detailed answer with good credentials will let your answers shine. If you’re competing with other people answering then you can see how quality and authority ensure more traction on your answers. Not only that but being too self promotional and self serving on Quora will get you down voted. If you don’t put 100% into depth and quality on Quora then you may be wasting your time. Read this post to learn more about how to formulate your post on Quora to get maximum exposure and upvotes. Your business is highly reliant on being the authority when you have competition in your industry. And who doesn’t have competition? Creating a Quora profile and answering questions is a great way to show and create authority for you and your business. Answering a few questions a day can build up over time and create a steady stream of valuable traffic to your business website and bring in quality leads. Your online presence is an important way to grow your authority and become better known to people. An online presence report will help you understand how others see your business on the internet. I just started using Quora recently and I find it to be very addicting. The potential to grow your blog is very real if you put in the work and remain engaged with the community. Absolutely Kevin, it’s a great place to connect with people on your topic of expertise, provide help, and prove your experience. That, of course, leads to more trust in you and with work put in it definitely will grow your blog/business/your social audience.